Today's post will explore two more complex aspects of this much under-rated issue: the booklets & booklet panes, and the coil stamps. 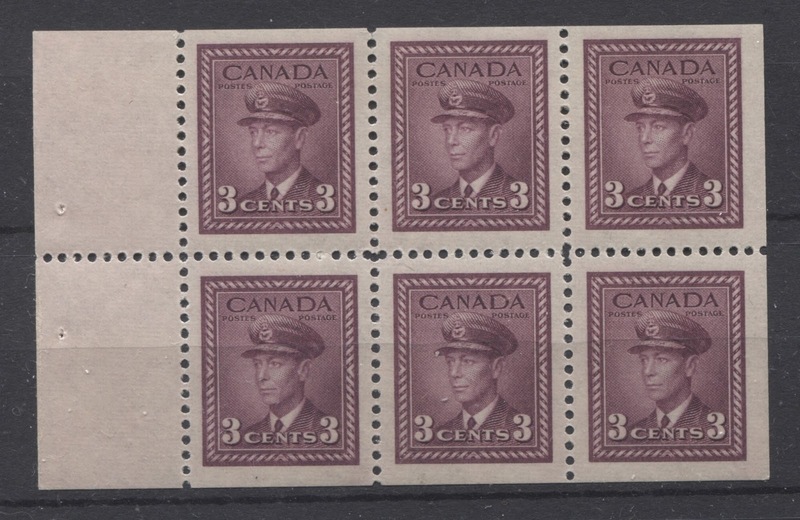 This is the only issue of Canada to have coil stamps in two different perforations: 8.5 and 9.5 vertically. 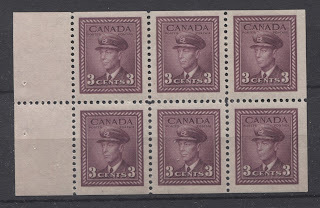 The original issue that appeared between 1942 and 1943, was perforated 8.5, and was generally printed on softer paper. 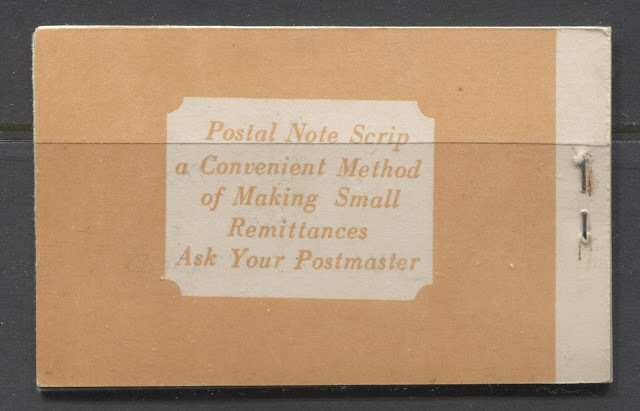 Later in 1948, the coils were reprinted on a thicker, stiffer paper and were perforated 9.5 instead of the 8.5. The difference is marked enough that with experience, you will be able to distinguish them from one another without having to measure the perforations. The scan above shows the two different perforations, with 8.5 on the left, and 9.5 on the right. As you can see, this difference of one hole, makes a large difference to the appearance of the stamps. In general, the perf. 8.5 coils tend to have holes that are often not fully punched, and are widely spaced, giving perforations that are much wider, and consequently much harder to find with fully intact and even perforations. The later perf. 9.5 coils have holes that are punched much more cleanly, and are spaced closer together. It is worth noting that the 3c carmine is only found in the perf. 8.5, as this colour was superseded in 1943, long before perf. 9.5 stamps appeared. Jump strips exist for all three values. Start and end strips of 4, plus 10 blank tabs exist for all three values. The strips that contain four stamps with 10 blanks are premium items and are much scarcer than the strips of 4, which consist of two stamps and two tabs. The above scan shows a typical jump strip. 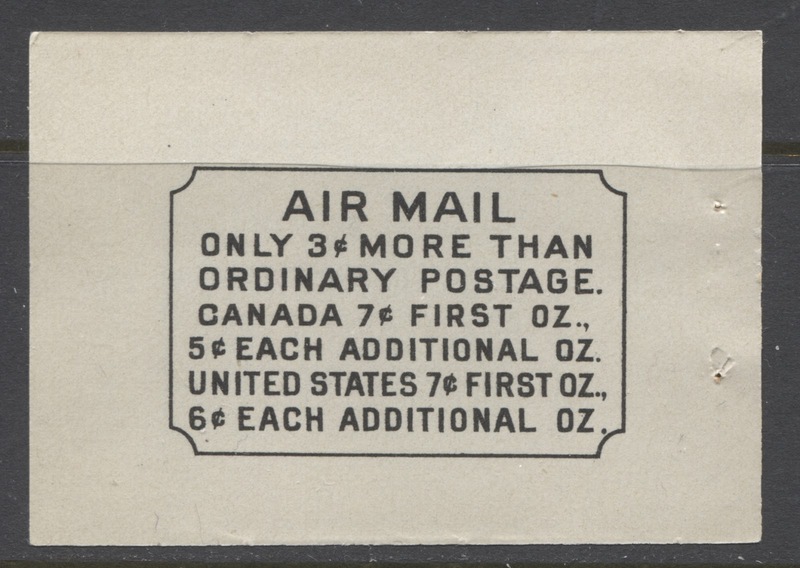 The jump in this case occurs between the left stamp, and the other three stamps. 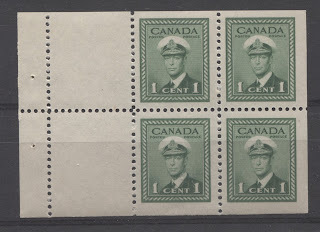 If you look carefully at the width of the top and bottom margins on the strip, you will see that it is different above and below the left stamp, as compared with the rest of the strip. The difference is small enough that if you are not paying attention, you will miss it. However, once you know what to look for, the difference becomes quite easy to spot. Jumps occur periodically on all coils printed by the CBN. The reason has to do with the way the coils are printed. My understanding of this process is that the plates of 100 had to wrapped around a steel drum into the printing cylinders of 100 stamps that printed the sheets, which were then cut into strips. My understanding is that these strips were normally 500 stamps and the repair paste-ups only occur when a strip came apart accidentally. Thus, to produce a strip of 500 stamps, the printing drum would have to complete 5 revolutions. Each time it completes a revolution it can meet the paper web in a slightly different position for the next revolution. This is how the jumps occur. Also, there can be a noticeable difference in the spacing between stamp impressions where the jump occurs. However, these differences do not occur on some of the jump strips. In addition, to this, there is often a fluctuation in pressure where the drum completes a revolution, which can result in a lightening, or a deepening of the impression at the spot of the jump, or the spot where the next revolution starts, where this is not accompanied by a jump. This next scan shows one of the typical spacing varieties that can be found on the coil stamps. Here, the difference can be seen between the right stamp and the other stamps. The horizontal space here is 4.5 mm compared to the normal 4 mm or 4.25 mm. I'm not sure what the cause of these spacing varieties are, as there appears to be no jump. They could be the result of the printing drum completing a revolution and starting the next one at a slightly greater distance, or they could be the result of actual differences in spacing between impressions on the drum. 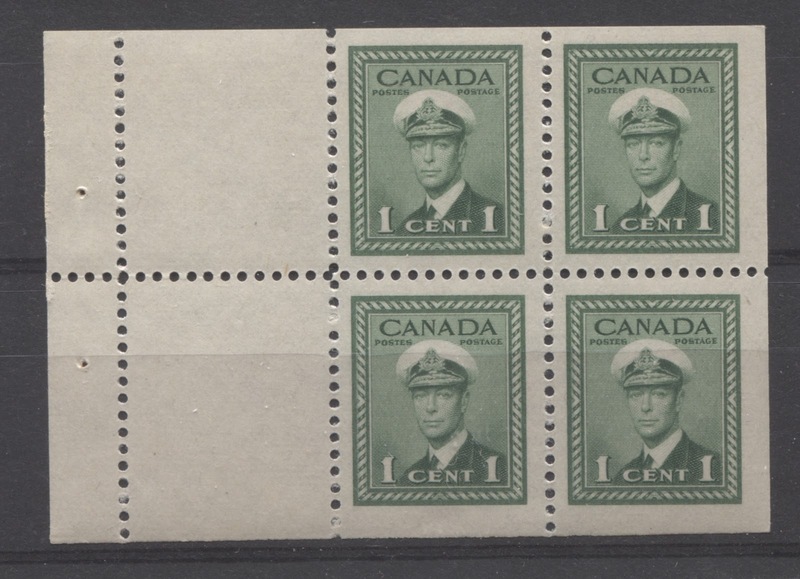 This strip shows another spacing variety, with a very, very slight jump visible between the middle stamps. Again, the space is 4.5 mm compared to the normal 4 mm, in between the two right hand stamps, or 4.25 mm between the two left hand stamps. In addition, if you look carefully, you can also see a difference in shade between the two left hand, and two right hand stamps. 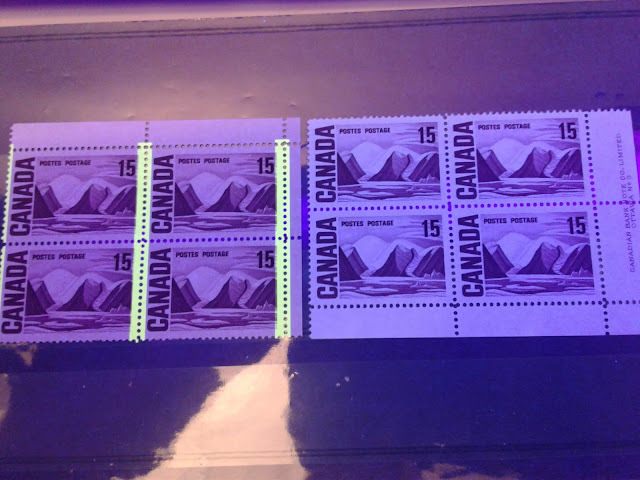 The stamps on the right are both deeper and brighter than the ones on the left, while the left frame of the second stamp from the right appears a little blurry and over-inked. This is a recurring type of variety that occurs on many of the coil issues, and is responsible for creating many of the constant varieties on the later issues, such as the damaged corner on the 2c Postes-Postage issue, and the damaged "E" on the Wilding Issue. The difference in shade and the varieties result from a difference in pressure between the printing cylinder and the paper, with the pressure on the right stamps being greater than the stamps on the left. There are also several shade varieties that can be found on the coil stamps as well. The 3c claret seems to be the best stamp for shades, through worthwhile shades can be found on the 4c value as well. I find the shades on the 1c and 2c to be so subtle that only the most detail-oriented collector would be likely to collect them. However, with careful comparison, you can definitely identify shades in all coil stamps of this issue. The scan above shows two nice shade varieties of the perf 8.5 3c claret coil. On the left we have a deep brown purple, while on the right we have a deep claret. Here we have an even more marked shade difference, this time on the perf. 9.5 coils, with the pair on the left being a true light rose violet, while the pair on the right is deep claret. 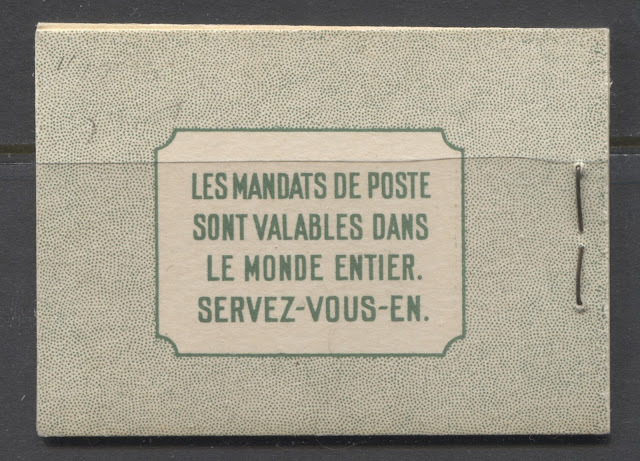 Bilingual booklets were introduced, in addition to the normal English and French versions. The so-called "chewing gum" booklets were introduced. These booklets contained small panes of three stamps and looked a lot like a pack of Wrigley's gum. Like the English and French booklets, the bilingual booklets utilized their own cover designs, each of which required different dies as well. So their inclusion in the lexicon of booklets increases the complexity associated with them quite considerably. Before I get into the specific booklets and varieties in all their complexity, lets start by taking a look at the various booklet covers and becoming familiar with them, as small differences in these are what lie behind the immense complexity of the booklets printed for this issue. I will start with the English covers, then look at the French covers, and finally the bilingual covers. Peter Harris, a well respected, and as far as I know, retired British dealer, has identified a number of different dies that were used to print the various front and back covers that were used for the booklets of this period. 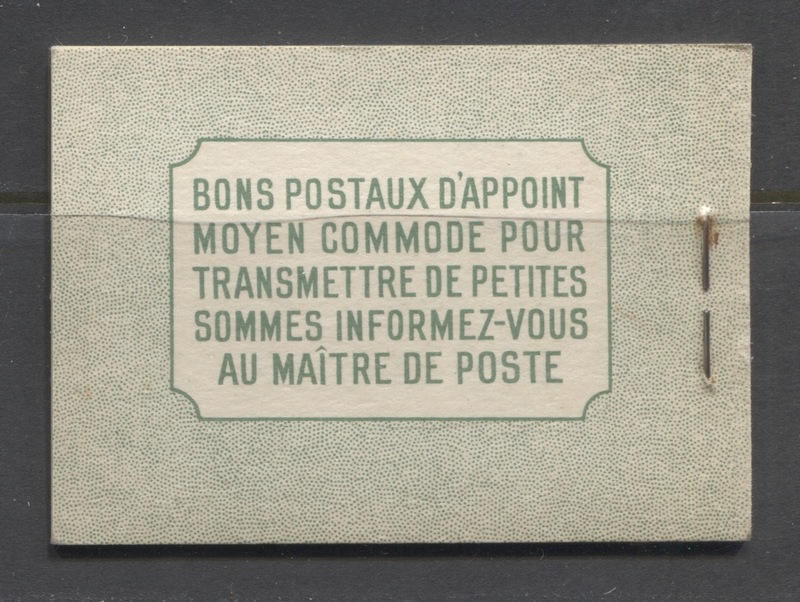 What makes the collecting of booklets from this period so complex, is that there were several dies used for each of the front and back covers, and in many cases, several permutations and combinations are possible for both English and French covers. Harris wrote and published a book titled "Canadian Stamp Booklets, Dotted Cover Dies 1935-1955". 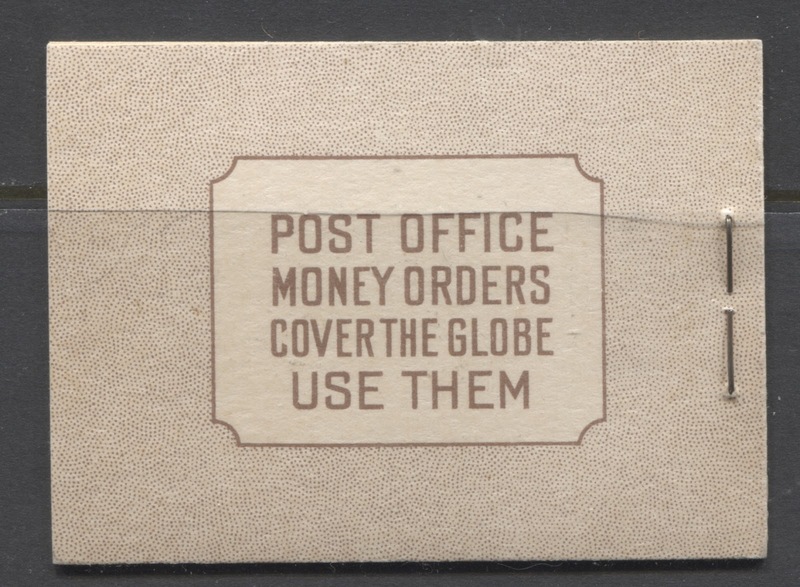 It is available from most stamp dealers, and Phil Banser, the philatelic literature dealer in the US likely sells it also. So I do not wish to plagiarize his book by including scans of all his illustrations. However, I will provide a summary of the different types and describe how they can be identified. But if you want to see the easy to follow illustrations, you should obtain a copy of his book. 2c brown had a light brown cover. 3c carmine had a salmon-red cover. 3c claret had a mauve cover. 4c carmine had an orange cover. 1c + 2c + 3c combination booklets had a light violet cover. 1c green - One type has one dot in the P, while the other has two dots. 2c brown - One type has two dots inside the P, while the other has three dots. 3c carmine - One type has two dots inside the P, while the other has three. Combination booklet - as above for the 2c and 3c booklets. 4c carmine - all front covers have two dots inside the P.
This third type of English cover was not discussed by Harris, as there is only one type. 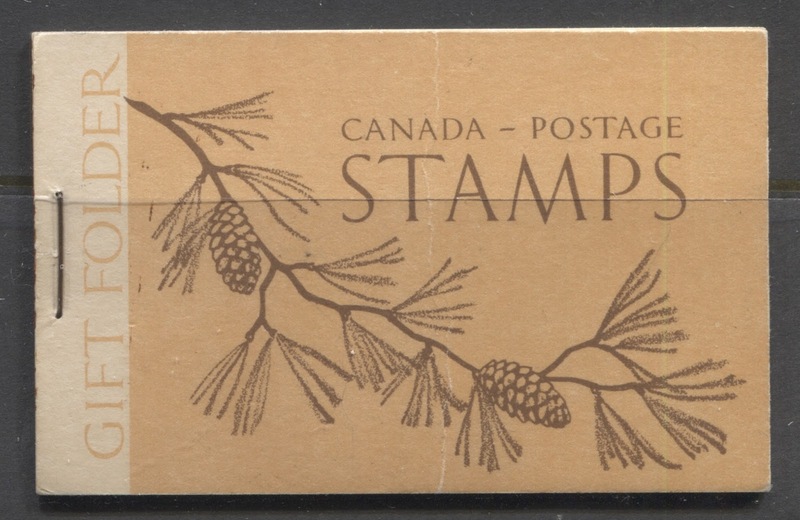 It was used only for the $1 gift booklets that were sold in 1947. The French version looks exactly the same, but in French. There was no bilingual version of this cover. The first type shown above has "Post Master" as two different words separated by a space. 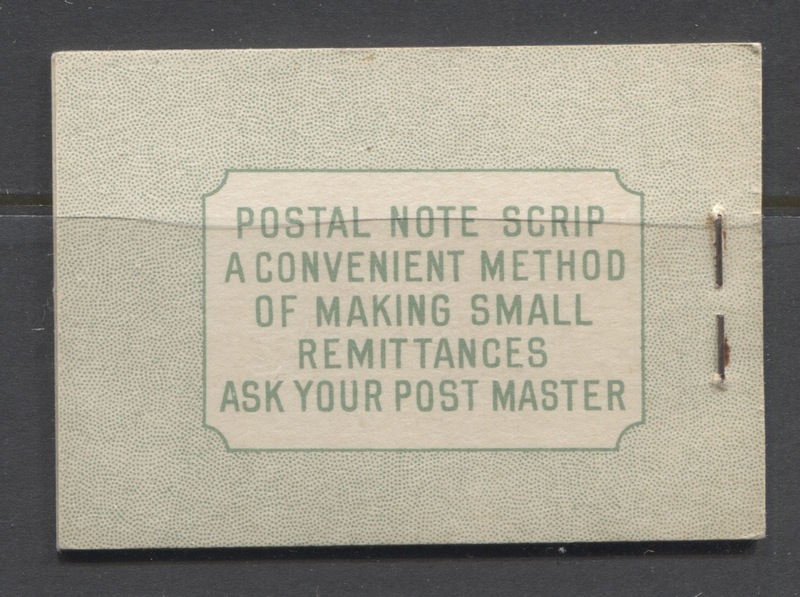 The second type has "Postmaster" as one single word. 1c green booklets - all eight types, with both types of front cover. 3c claret booklets - all eight types, with both types of front cover. 4c carmine booklets - all eight types, with both types of front cover. Combination booklets, which usually only occur only with the first type of front cover (the one with two dots inside the P). 1c green booklets - with both types of front cover. 2c brown booklets - with both types of front cover. 3c carmine booklets - with both types of front cover. This is the back cover of the 1947 gift booklet. Again, the French version looks exactly the same, except that the text is in French. 1c booklets - One type has two dots inside the P, while the other has three. 2c booklets - Both have two dots inside the P, but one has then arranged in a diagonal pattern sloping downward from left to right, while the other one has the pattern sloping upward from left to right. 3c booklets - One type has two dots inside the P, while the other has three. Combination booklets - Same as above for the 3c booklets. 4c booklets - One type has three dots. The other three all have two dots arranged in a diagonal sloping pattern. On the second type, the slope is upwards from left to right. On the third and fourth types, the slope is downward from right to left, with the slope of the third type being lower (flatter) than the fourth type. Here is the French version of the Type IV cover, which Harris refers to as a Type V. Harris as identified 8 different dies. All of them are distinguished by comparing the dot pattern of the dots just to the right of the half-circle that is at the top of the coat of arms. It is too difficult for me to describe the different patterns as they are complex. So you can simply compare and contrast the booklets you have, knowing that there are eight types. But if you want to identify a specific type that you have, you will need Harris's book. 4c carmine booklets - with only the type that has two dots angled upward from left to right. Combination booklets - with both cover types. One type has a line of dots emanating from the right corner of the lower right corner of the text box, and angled downwards at about a 45 degree angle from right to left. One type has two slightly curved rows of dots emanating from the same corner of the text box at about 150 degree angle to the right of the text box. A third type has three horizontal rows of dots emanating from this corner and from inside the half circle, and moving toward the right of the cover. The last type has six dots arranged in a convex arc that closes the half circle of the lower right corner of the text box, while enclosing a single dot within. 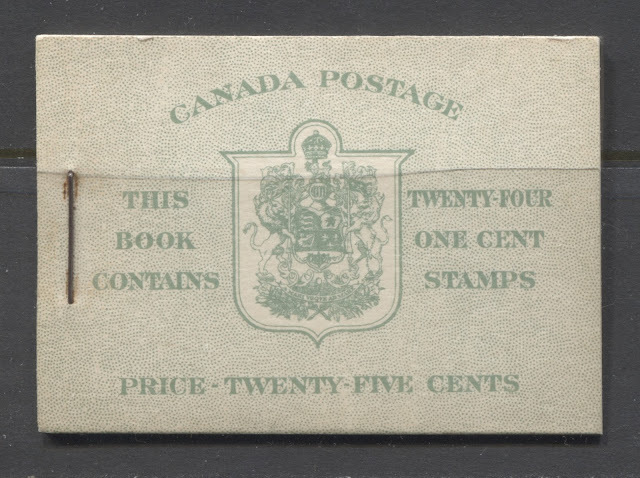 1c green booklets - The first two types are found with the first front cover type, while the last two are found with the second front cover type, so that there are only four different booklets, rather than eight. 3c claret booklets - All four types with both types of front cover. 4c carmine booklets - All four types, but only with the front cover that has the two dots at the 45 degree angle. This is the French version of the Type H cover, which Harris calls Type J. Like the front cover, there are eight different die types, which means that there can possibly be up to 64 different basic booklets, though many of these front and back cover types are not yet known. The eight types are distinguished by looking at the dots to the immediate left of the lower left corner of the text panel. The types are so similar that it is too difficult to describe them accurately here. However, you can always compare and contrast the booklets that you have, knowing that there are eight reported types. This is the bilingual front cover found on the chewing gum booklets that were issued in bilingual form. 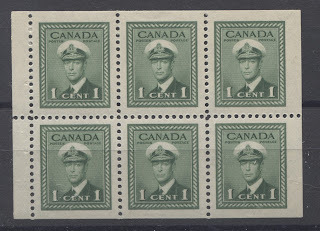 Harris refers to these as type VI covers. There were no fewer than 15 different dies used for these, though not all of them have been reported on the booklets of this issue. The types are distinguished by the dot pattern to the left of the half circle at the top of the coat of arms. On the 1c booklets you have to look at the dot pattern to the left of the shield above the word "book". One type, there is a 45 degree line of dots that encloses the space and four dots within that space. On the second type, there is a curved arc of dots that emanates away from the shield, and to the left. 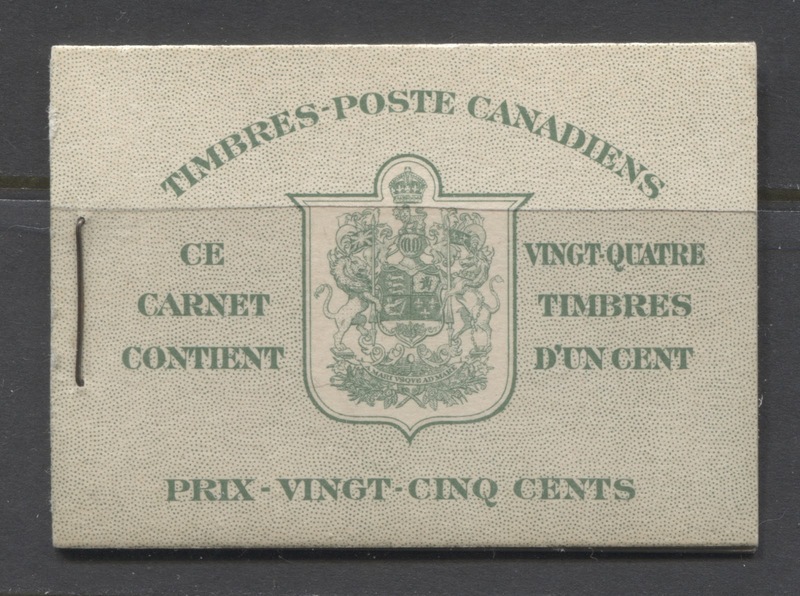 On the 4c booklets you have to look at the upper inscription where it says "Timbres-Poste" and pay attention to the shape of the hyphen between those two words. On the first type, the hyphen is pointed, while on the second, it is squared off. This is the back cover of the bilingual chewing gum booklet, which Harris refers to as type K. Like the Type C cover, that had the two sub-types, depending on whether "post master" was one word or two separate words, this one also exists in two sub-types as well. In addition to these two sub types, Harris has identified up to 15 different dies for each type, and these are distinguished by looking at the dot pattern to the left of the upper left corner of the text panel. This makes for a staggering 450 possible booklets for this format! However, nowhere near this many have, as yet been reported. The difference between these different dies is too difficult to describe here, so you will have to simply compare and contrast the booklets that you have, or refer to a copy of Harris's book that contains the full pictorial chart. On the first type, two rows of dots emanate from the upper left corner of this corner and move downward to the bottom right of the corner, almost enclosing the half circle that is in that corner. On the second type, there are two semi-circular arcs that intersect in the middle, and together, they enclose about 3/4 of the half circle in the lower left corner of the text panel. This concludes my discussion of the different cover types, and gives you some insight as to why the collecting of the booklets from this issue can get so complicated. When the rates were increased to 7c in 1943, the old rate pages were surcharged to use them up until new ones could be prepared. 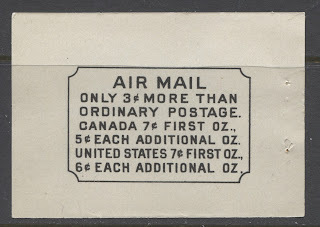 Some were overprinted with a large "X", while others had the old rates blacklined out, and the new rates added in text form. Again, all of the booklets except for the chewing gum booklets exist with the blacklined rate pages, while all the basic booklet types except for the 4c carmine booklets and the chewing gum booklets exist with the "X" on the rate pages. However, not all of the front and back cover combinations exist with these rate pages, though many do. 1c green booklets - English, French and bilingual. 3c claret booklets - English, French and bilingual. 4c carmine booklets - English, French and bilingual. The chewing gum booklets - English, French and bilingual. 2c brown - English and French only. Combination booklet - English and French only. If you look carefully at the two booklets, you will see that the staple of the booklet on the right is larger than the booklet on the left. The booklet on the right has a 14 mm staple, while the booklet on the left has a 12 mm staple. All known 1c green booklets used 17 mm staples. All known 2c brown booklets used 17 mm staples. The 3c carmine booklets are found with all three sizes, though the 14 mm ones are rare, and both the 12 mm and 14 mm staples are only found with certain cover combinations. All known 3c claret booklets used 17 mm staples. The 4c carmine booklets are again found with all three sizes, and again, some are rare, and found with only certain cover combinations. The combination booklets are found with both 14 mm and 17 mm staples, and again, some of these are quite rare. The chewing gum booklets are found with 12 mm and 17 mm staples. Beyond the pure interest in collecting all the known booklet types, the staple sizes are important also because they help to verify the authenticity of the booklet itself. Many of the scarcer booklet types have been faked by taking genuine booklets, disassembling them carefully, and then taking the covers, panes and rate pages and reassembling them into the scarcer types. However to do this the booklets have to be re-stapled, and these new staples will not match the original staples used, either in appearance, or in size. The second type of pane is the pane of 6, with narrow selvage tab. 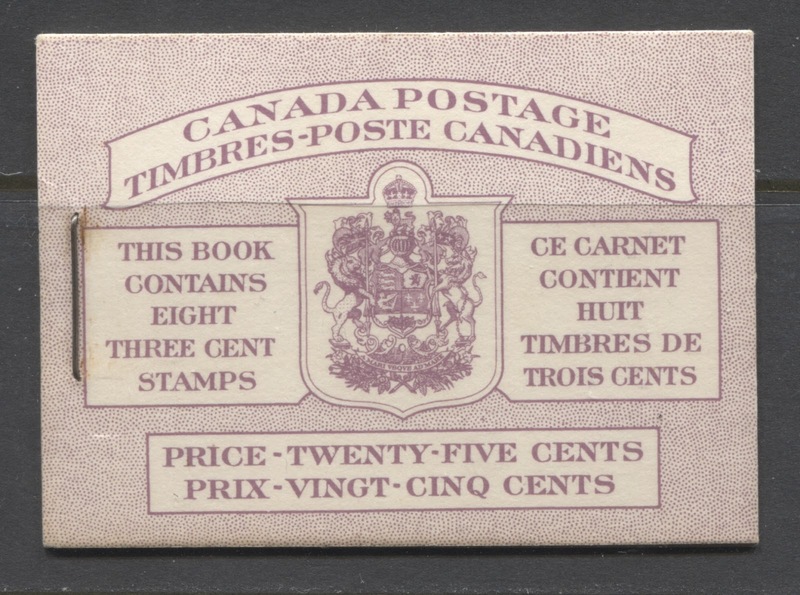 These come from 25c booklets, so that the 1c was issued in booklets consisting of 4 panes of 6. The 2c was issued in booklets containing 2 panes of 6, and finally, the 4c carmine red was issued in booklets containing a single pane of 6. This format was not used for either the 3c carmine-red, or the 3c claret. The third type of pane is the pane of 6 with wide selvage tab. 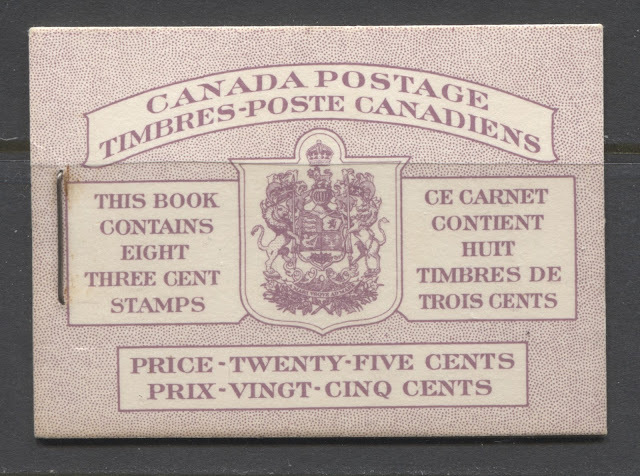 These came from the 1947 gift booklets that sold for $1 and contained 1 pane each of the 3c claret, the 4c carmine red, and two panes of 4 of the 1946 Peace Issue Airmail. As this stamp is really part of the Peace Issue, I do not deal with it here. The final type, which I do not have an illustration of, is the pane of three from the so called "chewing gum" booklets. These contained one pane each of the 1c green, 3c claret and 4c carmine red. It had a face value of 24c and sold for the full 25c. As with the sheet stamps, it is possible to find the panes exhibiting variations in the paper, gum and shades, similar to the sheet stamps. I have not handled enough booklet panes to be able to definitively state that the variations in the panes are as extensive as the sheet stamps, but I suspect with the number of panes printed, and the time period over which they were issued, that there must be almost as much variation. As if the booklets are not complex enough, after considering all the above factors, you can make a collection of them even more in-depth by collecting variations in the panes contained within the booklets. 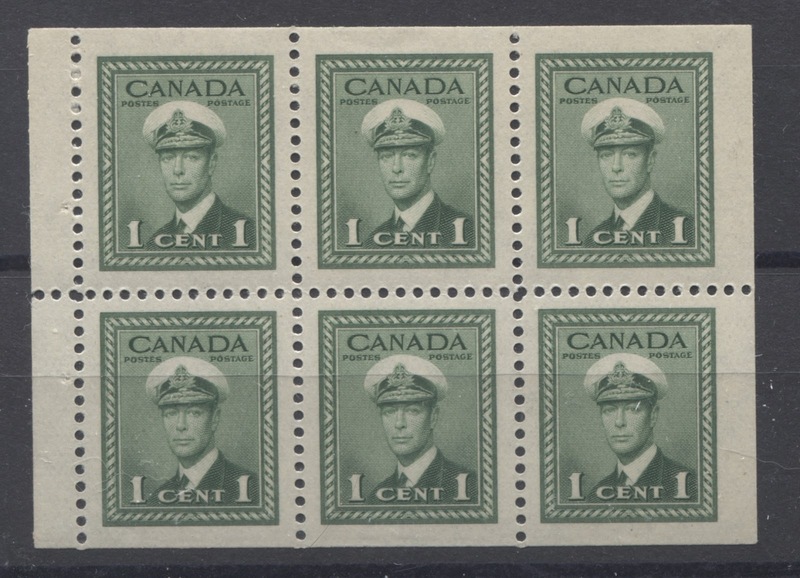 This is a largely untapped area of Canadian philately that could prove very rewarding to a specialist with the inclination to tackle it. 15 different 1c green booklets. 10 different 2c brown booklets. 8 different 3c carmine booklets. 9 different 3c claret booklets. 9 different chewing gum booklets. 52 different 1c green booklets. 12 different 2c brown booklets. 16 different 3c carmine booklets. 32 different 3c claret booklets. 75 different 4c carmine booklets. 79 different chewing gum booklets, with more possibly undiscovered! 3 different different gift booklets. That makes a total of 281 different booklets, if you ignore paper, gum and shade differences in the panes themselves. If each booklet exists with 2 or three different shade, paper, or gum varieties, you can quickly see how a specialized collection of these booklets can number 1,000 different booklets. This brings me to the end of my second post about this issue. Next week, I will cover the final aspects of this issue, including the proof material, the OHMS perfins & overprints, and the postal history. It is my hope that after reading this some of you are starting to see this issue as a very meaty and worthwhile challenge.